This band was added to our database on April 17, 2002, and the band's information was last updated 11 years ago. zebra is responsible for keeping this band's information up to date. This page has been viewed 31334 time(s). 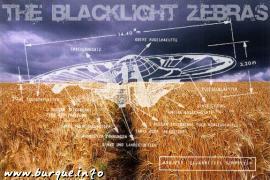 Play all of The Blacklight Zebras. 's songs. Recorded @ Fear Studios_Albuquerque by Keith w.
for a few years there i always thought this was my best track. performed it at pulse for the burque luv cd release party and i think thats one of the highlights of my musical career, hundreds of kids goin nuts, and iz freakin out gettin down. whew* this one came from the same batch as animal, same time frame and method. you can hear the fruity c_kick, threw down a bassline and the rest is pretty much just jammin'. cool edit pro. not much editing really or mastering. no sequencing. all live keys. korg ms2000. "ultraviolets [burque luv five left]"
Featuring vox by Necrophoria(Xiphoid Process). performance by The Blacklight Zebras. 2006. probably the best track i have ever written. all around. my best mixing and playing definitely. if i was locked in a room for hours a day tweaking synths and logic this is what i would write. the moai bass lead idea i started doing all the way back on ultraviolet pilot comes full circle in my playing on this track merging with the new psytrance influence. oddly though, this still is not a psytrance track. it has rave elements, psy, and more laid back trance and psychedelic rhythm in the main riff. and the second part that comes in is more industrial arp. robin the hood and givin' to the floor! virus, LE7, coffee, bushmills. access virus, LE7. 2006. just jammin, movin on to a better place in life. coffee. messin around with a house beat. the coffee is completely responsible. but still some of my better layering/collage handy dandy. Unfinished. Scraps from 2006. An unfinished idea. but i always loved this riff, and it is technically one of my best. just thought it might be some inspiration to someone else. feed the machine. some day ill get some ritalin, and quit my pidlin'. Track off of ep with the same name. One of my heaviest tracks. 2006. Definitely this track is the product of some pretty dark and angry times. Malicious really. it skips a few times because im using a demo of izotope mastering software im too ghetto to afford. so i ripped it with the skips. access virus, LE7, korg electribe(the blue one with the valves). i think i recorded this while i was couch surfing at sindrones pad. yeh, i definitely did, thats his korg in there. Wrote this one right around burque luv 5? went through a phase there of a real particular sound using korg ms2000 and fruity loops to lay down beats then overdubbed in cool edit pro. main synths are a little off, not sequenced, all live, a little sloppy. my mastering wasn't very good. pretty much just plug in and record and bam! goodness sakes, hot cakes! me and chris threw this one down after work one day. korg microkorg, yamaha rm1x, cool edit pro. i had no idea how to use cool edit at the time, but i think we were having technical difficulties with the recording so we recorded to cassette or something? there is also a guitar version. Another 2006 track. pretty manic, lots of coffee. this is what happens when i listen to hocico. i pretty much ripped off the opening arpeggio style and the rest is his story.. the middle leads are more a psy-trance influenced technique i seemed to be developing in my playin more and more. i call it moai. cause it sounds like moai flying around in my crazy head. very monolithic kind of thing. and lots of out of control rabbit in there too just jammin. wanted to see how low the virus could go too and still make sense. so there it is. manic jamming. access virus, LE7. House cleaning.. what is this track? undoubtedly inspired and assimilated from industrial/synthpop scene influence. just another 2006 jam that i never finished. im sure lots of coffee was involved here too. acces virus, LE7. the kick hurts my ears but i generally like the main progression. my playing and engineering opened up quite a bit in 05-06. and i can hear a little orbital-halcyon in there too. i was actually cleaning houses for a living when i wrote this so i think it does kind of express the general feeling that surrounded that job and time for me. wrote this track right around oscillation. back when i was using only the yamaha rm1x sequencer. this was recorded directly into a tascam cd burner. pretty excellent quality and level considering there was no recording software or mastering. back when i was doing a bit with the yamaha flute pads. that was one of my favorite things about that box was the flute pad. one of my stronger, earlier tracks. all garageband here. and a midi board. i was really just getting into computer sequencing and soft synths, exploring testing things out. this is just real basic, somethin i threw down while i was gettin' schooled in many ways. was just getting into apple computers and didn't have any real gear at the time. one of my favs from this time. access virus, LE7. i was in very bad shape personally and thats why this track is soo good, for being mine. personal relationship failures and general darkness found me tweaking synth and logic for hours in the dark. i was listening to almost exclusively mind in a box. and thats why this could almost be a mind in a box track. i wasn't trying to rip them off, its just how i was feeling. that tight bass lead with the twisted reverb is probably influenced by depeche mode. but thats just how i regurgitate things i listen to i guess. then it goes into a stevie nicks, car commercial feel when the bass lead double times. very car commercial. © copyright 1993-2007 by fearstudios.com ( 186215974+275ms ). All Rights Reserved. Report a bug or make a suggestion.